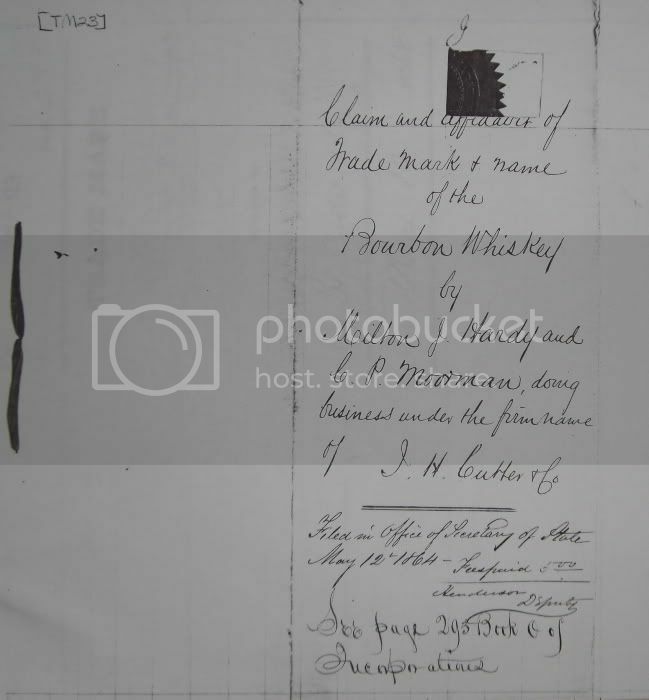 This the trademark applied for by Hardy and Moorman, where George Parker was made agent for J.H.Cutter whiskey. His signature is seen as the representative of Hardy and Moorman. 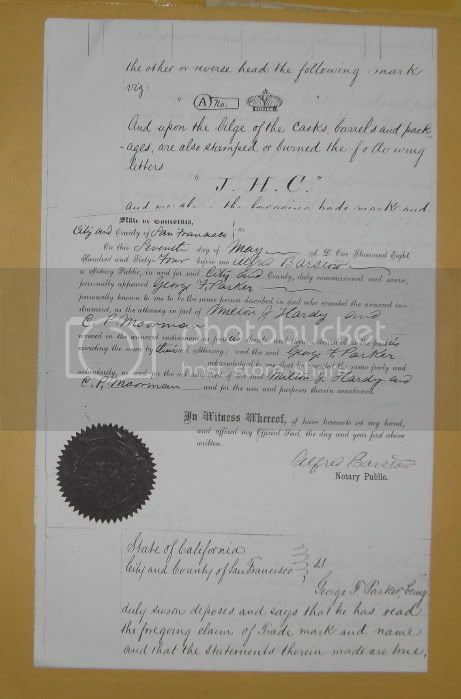 This is a very early trade mark, No 23, and is dated May 12, 1864, but the application was completed, signed, and witnessed 5 days prior to that. This claim is for casks, corks and packages; there were no embossed bottles known to have been made at this time. The file contained no samples of packaging, labels, etc. 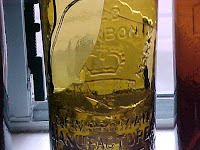 "old and authentic amber glass handblown Applied Gloppy Top KELLOGG'S NELSON COUNTY EXTRA KENTUCKY BOURBON WHISKEY W.L. CO SOLE AGENTS whiskey bottle 5th." "I'd be very careful about representing this piece as a glop top. Simply, they do not exist in this mold configuration. The only glopped Kellogg's are the red whittled ones that were blown in Germany in the '90s. They are a totally different mold and are blood red; not to be confused with the Riley Patent IT's that were sloppily tooled here in the US and which come in various shades of ambers. I've had several domestics over the years that could be passed off as applied to a novice collector but have always erred on the side of conservatism and described them as "wannabe glops". This one could come back to haunt you..."
The email was met with a polite thank you And so the auction continues. And true to W.C. Fields observation of a sucker being born every minute, not one but two, suckers continue to slug it out for ownership. So far, the ante is up to $162~ and change for a bottle that might maybe bring $75~ at a show on a stretch, if you could find a buyer. Not bad; if you can get away with it. To the sellers credit, they did add a post script, buried at the end of the listing saying that it may not be a glop after all. However, this brings me to the point of the article; What, if anything, can be done to hold ebay sellers accountable? Ebay, has been, and continues to be, "The Wild West". 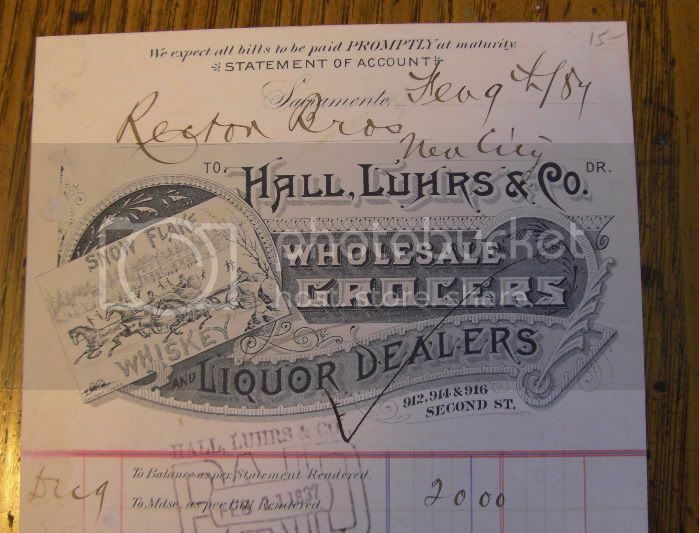 After the fourteen year litigation between E. Martin and himself over the rights to J.H.Cutter Whiskey, old A. P. Hotaling took nothing to chance and thoroughly trademarked his products, regardless of their location around the globe. In this instance, he established the claim of trademarks for his Kangaroo Whiskey in the provincial offices of New South Wales, Australia. This article is nothing more than an excuse to advertize J.H.Cutter Whiskies and the A.P.Hotaling Co's edifices. Today's media operates in much the same way, pandering to those whose favors keep them in business. Due to the sad fact that photos cannot be included in comments following other discussions, this subject will be continued in this post. The A. P. Hotaling Co was an agent for W.A.Gaines, of Woodford Co, Kentucky, during the first two decades of the 20th Century. As another commentor stated, the "Old Crow" brand was, and still is I might add, immensely popular "back in the day". 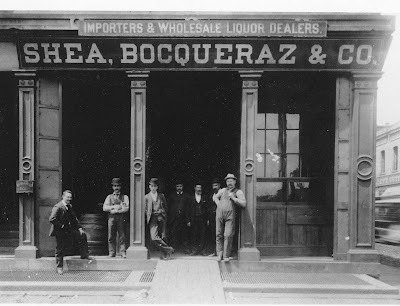 Bottlers for the brand were numerous, but no "Sole Agency" was determined by the distillery. 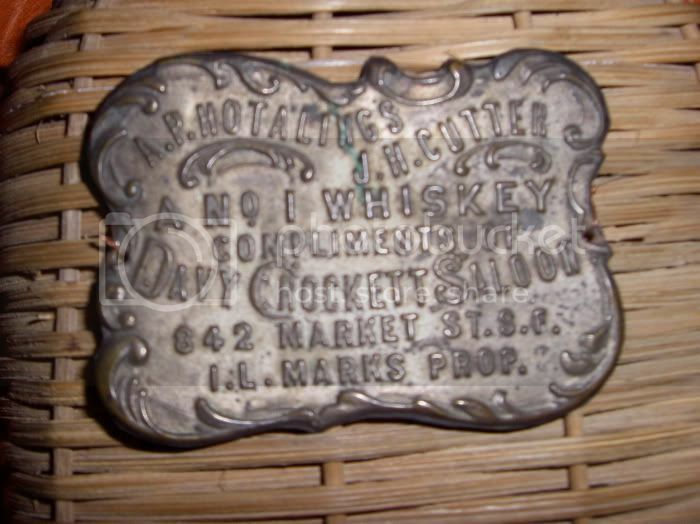 This example is a labeled bottle from the year 1914, and represents Hotaling's "Old Crow" connection. I wrote the following article back in August of 1989. It was published in the Antique Bottle & Glass Collector. I tried to include it as a reply to the Cornucopia portion of Sole Agents Whiskey News but the format of this forum will not allow attachments in a reply so am starting a new thread. Click on each page and it will open in a readable font size. Sadly, the article appears to have been prophesy fulfilled. Fooling around here with the three related Cutter bottles that collectors sometimes get mixed up on. The commentary that came up on the (pre 75 gang) post got into the dates of usage of these bottles. 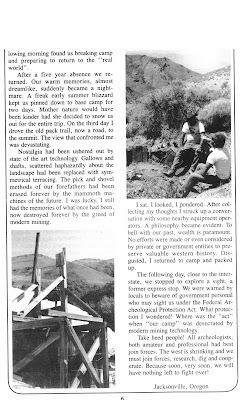 I am not sure when they were used exactly, but we can probably get a good idea from the digging experience that our readers bring to the blog. The O.K. 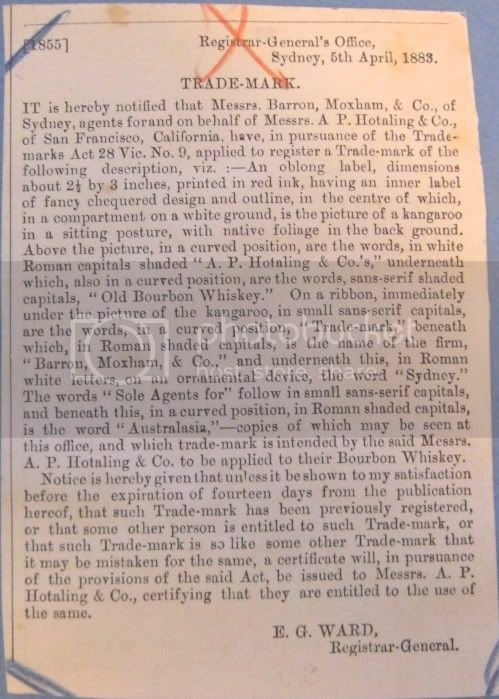 and A No 1 trade marks are registered with the state of California in late 1881. These bottles are in use before that date, and the O.K. Cutter long after that date. When was the beginning for the BIRD Cutter? As early as Dec. 1873 according to Thomas. I don't think they started that early, but I can't prove it positively. I have found them in towns that were at their peak in 1876-1882 time frame. What does the bird stand for? Is it in reference to the #1 grade of Cutter whiskey? Unfortunately no trade mark information is available for these bottles from the mid '70's. As 'Old Cutters' has mentioned, the archives has seen its share of interesting items disappear over the years. I want to think that there is some documentation on all three of these bottles from the mid '70s. It is not available currently, if it ever existed. Did the O.K. Cutter(t-41) replace the Bird Cutter(t-42)? They both have the similar phrase "Cutter OK Whiskey" or "A.P. Hotaling's O.K. Cutter Whiskey" on the reverse in different patterns. The A No 1 Cutter(t-40) is the oddball. Sure seems redundant, with all the Circle Cutters that say A No. 1 on the reverse. Here are some picts. to check out and compare these 3 bottles. A no 1(t-40) and Bird(t-42) from my collection. O.K. Cutter(t-41) Aaron Hill collection. I don't know what the bird signifies. Probably something to do with the #1 grade of Cutter whiskey -- the O.K. Whiskey. Here is the O.K Cutter(t-41) from Auction #47 - American Bottle Auctions. A nice example with very strong embossing. Notice how heavy the "slug"area is around the crown. I have seen some that the "slug" area is even more defined. A No 1 Cutter - usually found in lighter amber shades and whittled. Time of usage - possibly 1876-1878 or so. ?? Later?? O.K. Cutter - Aaron's is one of the nicer examples that I have seen of the O.K. Lighter yellow amber, whittled and full of swirls. Check out the "slug area" on this one, not nearly as pronounced. This particular O.K. has the look of the A No 1's . Did the O.K. and the A no 1 come on the scene at the same time, with the A no 1 being dropped quickly. Redundant bottle. ?? Everything is the same as the O.K., except the lettering A No 1. They are two separate molds however, the lettering slightly different. The A No 1 crown is "slugged on", but you have to look to look close to see it. I am not sure about these marks around the crowns. A No 1's lightly "slugged", O.K. 's "heavier slug", some very heavy. Here is the ultimate O.K. submitted by 'A.P.Hotaling'. Certainly the best color I have ever seen in one. I have seen Bird Cutters in a similar coloration, but I have not seen the A No 1 in a color like this. They seem to be in a narrower band of lighter amber to yellowish amber. Here compared to the typical O.K..
Not all valuable whiskies wear an applied top. There are a few "toolies" that appeal to "advanced collectors", as J.T. liked to call some hunter/gatherers of our particular bent. The "picture" theme continued to advance as the years wore on, with various subjects in evidence. 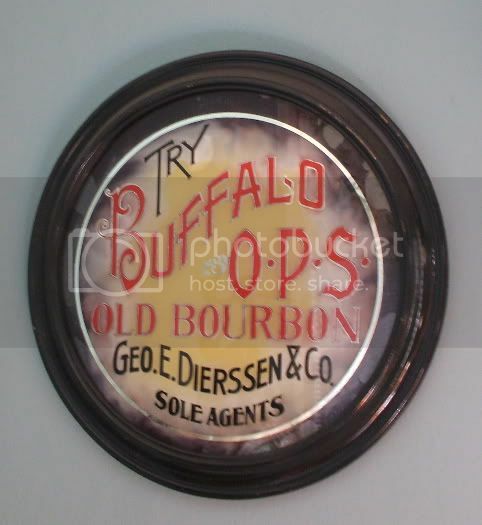 A Sacramento dealer, George E. Dierssen, advertised himself as "sole agent" for Buffalo Old Bourbon whiskey, along with promoting other wines and liquors. To date, I have not found a Kentucky distillery in Bourbon County that made this product. Was it merely a takeoff on the immensely popular beers brewed by another local concern, Buffalo Brewing Co's New Brew and Bohemian Lagers? The bottles did have a very similar Buffalo embossed on them. Oh well, that was way back in them days, so "takeoffs" were often tolerated, especially when they contained dissimilar beverages. Some of us are thankful for that. I have been fortunate to have dug several amber Buffalos and a dozen plus clear, applied and tooled ones. 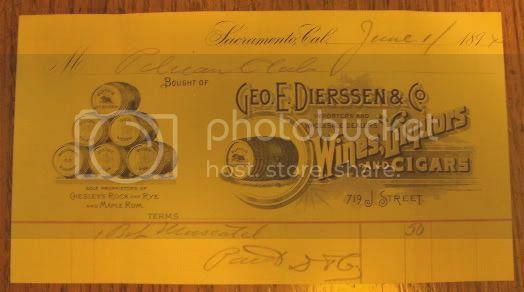 Thanks to another "advanced collector" also have the only piece of advertising known to have survived from Dierssen's enterprises. May has come and gone and I didn't add anything to my collection, how about you? Nothing for sale on ebay, I mean NOTHING! The S.T. Suits, sixth in yellow amber with a slight olive tone sold for $552.77. It was a better than avg. example. 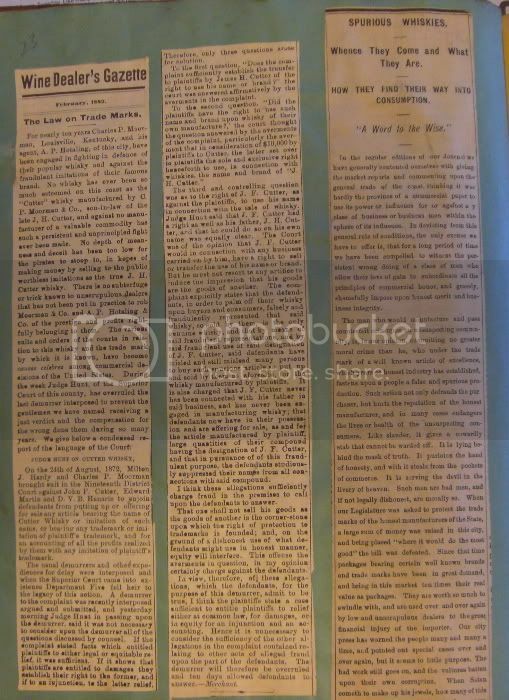 Same seller had an eastern Blakes, Adams-Taylor for sale, but I didn't see the closing price on it. That is all that I noticed for the entire month. Grim! Lance, how did you do on the extra Crown Shoulder Hotaling you had for sale? Maybe June will be better for us globby enthusiasts, a couple of shows this month. San Diego Show on June 13th, and the Oregon Bottle Collectors Summer Show in Aurora, Oregon on June 12th and 13th. If you need directions or contacts, shoot me an email and I will get right back to you, or click on the Federation link and check out show dates. I browsed through the Glassworks Auction preview, not usually a place for western globs, but sometimes for western bitters. Three Hostetter's lots was about the extent of western glass in there. So, I guess y'all need to get out and dig up something if you want to add anything... take a cue from the "Moleman". Anyone else want to fess up and tell us what they have found this year? I made a trip north of Elko, Nv in mid May. Blake and I thought we would try the area north of Tusky town, you know, the town where a broken Club House was supposedly found by some one's -brother's-son-in-law's-dad's- best friend's uncle. Thomas makes mention of this rumored find in his book. Rumors, rumors, I been suckered into Cornucopia a couple of times. 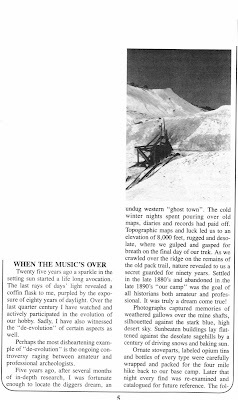 It had been a quite a few years, a new book on Nevada ghost towns was the latest "magnet". New information, a couple of new photos, ... great let's go!! Sure, by the way, did we neglect to tell you that a real recent mining operation pretty well leveled and obliterated whatever was left of 'ol Corny. And they're worried about a few bottle diggers. We could hardly find a shard of glass, let alone a place to dig. I am intrigued by the tangled web of related bottles from Wilmerding and Kellogg, separately or together. G.O. 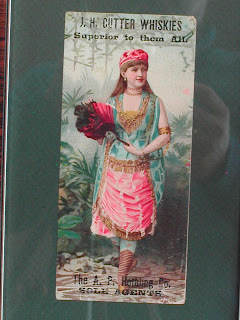 's post of the Wilmerding ad for S.H.M., and the chatter about the McKennas got me started. I'm going to just list some questions and assumptions and lets see where it goes. S.H.M(t-169) The Superior Hand Made is the oldest of the W&K bottles, at least the non C&I SHMs are oldest. Like I noted, we find these in Utah with the early stuff. 1873-74 stuff. The only other place I have seen them in abundance is C-bus, again 1873-75 stuff. C&I mold variation is much later by my estimation. A digger I know in the Idaho pan-handle area dug one in 1999 with just the lip broken out. He found it in some early 80's stuff. Just recently a C&I was located in the Boise area. Digging context unknown. 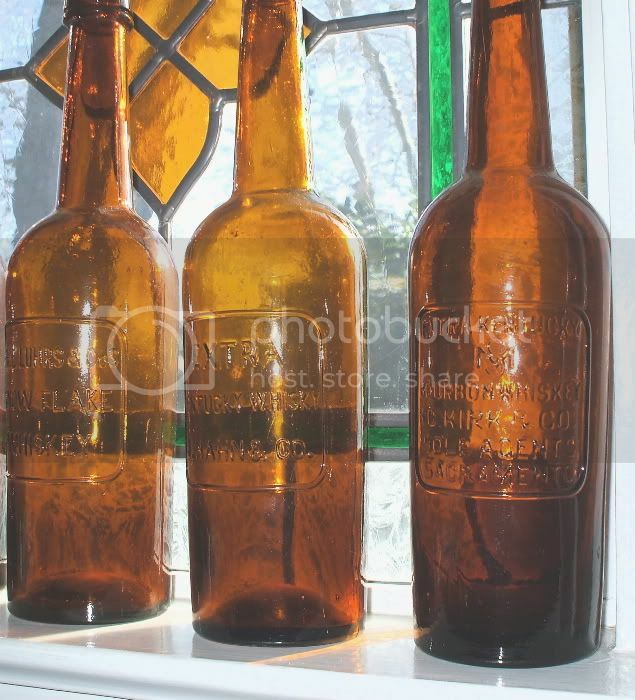 The C&I SHM's are very attractive bottles, whittled and light yellow amber color. McKennas(t-168) Mckennas long lived, say 1876-1883. Kellogg separated from Wilmerding, long before end of McKennas usage. Still, W&K on reverse shoulder. The C&I McKennas are found in Calif., Nev., and here in Utah. Found a couple of broken ones in a small mill town on Rush Lake. This mill serviced ore from the Chicago Mine out of Jacob City, Ut. That would give this bottle at least a fingerprint in the mid to late '70s. I just purchased one from a digger in Nevada, said it came from Storey County. Digging context unknown. C&I Mckennas color range from medium amber, orange amber, to fairly dark amber. Not even close to the SHM C&I variants. United We Stand(t-170) circa 1878-1883, Kellogg gone, Wilmerding is on his own with this one. W in circle on the back. No C&I variant with this bottle. Why not?? C.W.Stuart(t-146) circa 1883-87. Wilmerding definitely the distributor. Sold the brand to Loewe Brothers in 1892. Much later bottle than once thought. Two broken examples found in the Idaho panhandle, both in '80s stuff. All examples have C&I glass works initials on base. Using the back half of the Cassin's Golden Plantation(t-16) mold. Which has the C&I initials on the base of course. What is the relationship between Wilmerding and the Cassin Bros.? Golden Plantation fifth is also later than once thought. Whenever it disappeared, was as early as the Stuarts could have started. Using the same mold. And as if to play with our heads just a bit more, Stuart -(Wilmerding) has the small letter "k" on the reverse. Why a K?? Kellogg was long gone when the Stuarts came out. A "w" - Wilmerding, even a "L" - Loewe Bros, but a "K"
Kelloggs(t-171) circa 1890's. Red amber - German blown. W.L. Co. -- Wilmerding and Loewe. Some known with W & Co.-- Wilmerding & Co.
Alright, now that I have confused everyone, even myself, lets talk about the C&I variants. Supposedly C&I glass works stopped production of bottles in 1875. None of the 4 mentioned fifths with the C&I initials were made that early. ?? Lettering style, or font, on the C&I fifths is different than the counterpart W&K fifths. Golden Plantation fifth also with so-called "eastern style lettering". C.W. 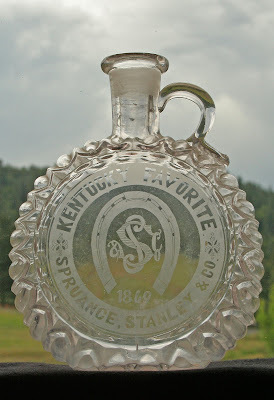 Stuart bottle has "western lettering", curved leg 'R'. Of course the Stuarts was just using the back half of the Golden Plantation mold. Which means, likely, that the "mold re-use"... Stuart from Golden Plantation was done in San Francisco... ?? The glass characteristics of the 4 C&I fifths appears western to my old eyes, espec. the SHM and the Golden Plantation. Hard to quantify this, but the glass comes out the ground fairly clean with these C&I's. Compare that to other Pittsburg blown glass you find in the west. The amber Rosedale fifth definitely Pittsburg product, MCC - McCulley Glass Works, usually look like hell when they come out of the ground. Beside the fact C & I was out of business before these bottles were blown. Did another Pittsburg works blow these bottles? So what gives? Molds made in Pittsburg, shipped west to be used at SF glass works? Plenty of mold makers in San Francisco by 1875. Why two molds anyway, weren't cranking out that many bottles. McKennas variants are being used at the same time, SHM variants seem to have quite a time break in usage. I'm going to let this sit here for your comments and corrections. This is what I like, stir the pot for new ideas and new information. Or maybe just some adjusting of the cluttered mess in my head... Wilmer"ding" has made me ding-eeee! 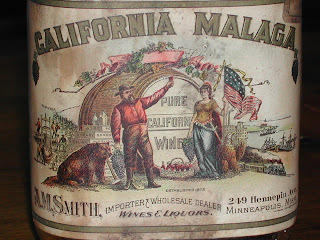 This label for a A.M.Smith Wine Varient has a great image of Lady Liberty Holding a cluster of grapes with a pioneer looking at his new glass of wine along with a grizzly bear for this image of California Wines. 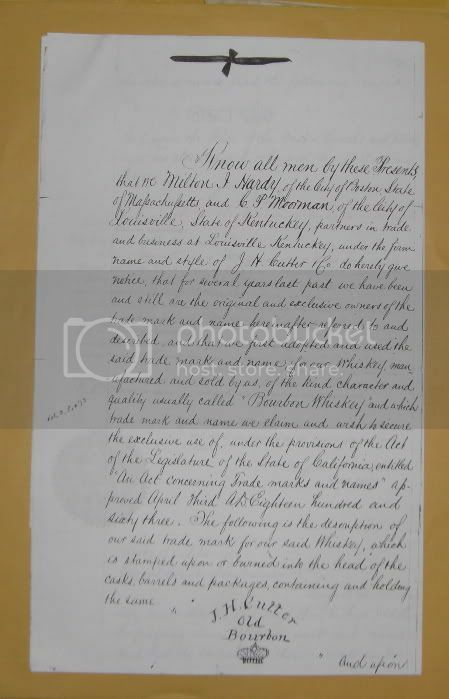 I also have a letterhead with the same images from the 1870's. From my collection. I know its not a glob top but great graphics none the less. Here is an interesting bottle that raises a few questions. One question is where are they coming from??? East or West. Has anyone dug one of these shoulder embossed 6ths in the West? G.O. 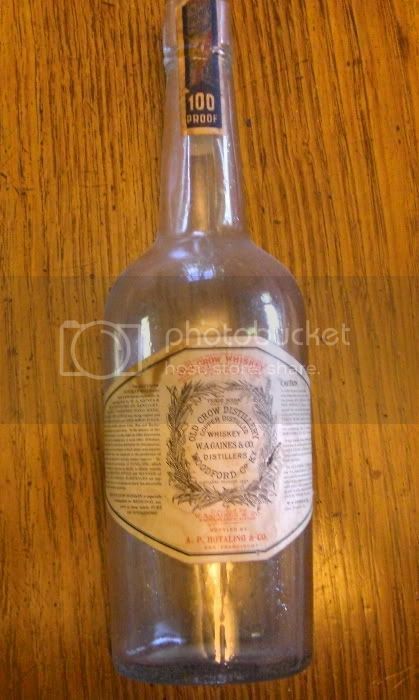 sent me an alert that an example of this bottle was on Ebay a couple of weeks ago. It was a good looking bottle, had a bit of greenish color to it. My example is orange amber which seems to be the standard color. The ebay example was being sold out of Penn., and the seller had a couple of other eastern glob cylinders. I have seen 8 or 10 of these over the years. Mine came from the Vegas show 15 yrs ago. Seen them for sale at Reno. Are they all migrating in from the East? I guess the possibility of this being a California version of the Suit's bottle has been on the table for discussion for a number of years. 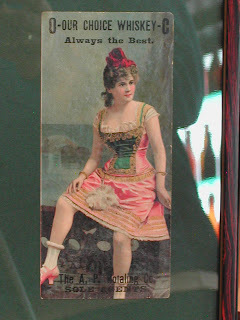 There are trade cards that exist advertising S.T.Suit with Booth & Co. /Sacramento; W.W. Dodge & Co. /San Francisco listed as "General agents for the Pacific Coast". 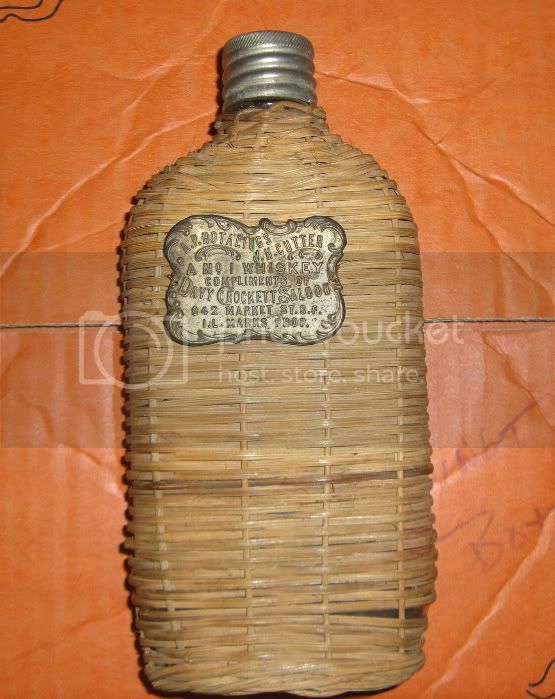 Did Booth/Dodge use this shoulder embossed bottle? My guess is no, probably just labeled only. Compare the eastern? version 6th to the western Walker Bros. 5th. numerous salt glaze jugs exist in various sizes.